We're always interested to see new methods for text input, because let's be honest here, the traditional keyboard is something that we've all learned to use, but it is nowhere near the most efficient method. And, Android is a platform that encourages experimentation in text input with its option for alternative keyboards. That's where the new Slice Circular Keyboard comes in, because while it is unusual, it could allow you to touch type on a tablet. Alternative keyboards are nothing new, because the traditional keyboard is designed to be inefficient (so typewriters wouldn't bind up). There have been other innovative options for text input, like the Dvorak keyboard in general, or on Android, starting with easier to grasp options like gesture typing with Swype, FlexT9, the Android 4.2 keyboard, and now SwiftKey, all the way to completely new ideas for mobile input like 8pen or Dasher. 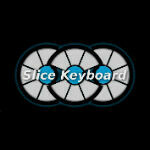 The Slice Circular Keyboard lands somewhere in the middle ground. While it is designed for a similar hand posture, similar movements to a traditional keyboard, and with the keys in similar positions, but the key is in keeping blank space with dedicated "home row" buttons. Each of the three buttons act as anchor points, so you don't have to move your hands, and you can theoretically touch type without looking on a tablet. The app only works on tablets 7" or larger, and there is a free demo if you want to give it a shot. If you like it, the full version is $4.99 and is available in the Google Play Store. Why not just do what I did a few years back and pull all the keys off your keyboard and rearrange it? It didn't give me the motivation to actually learn Dvorak, but that's beside the point. I put transparent dvorak stickers on my keyboard. Needless to say I still haven't learned it. Wow. That was way over my head. Michael H, i don't know anything about this one but is there an option to re-arrange the alphabets in the keyboard into our personal liking like you said above?